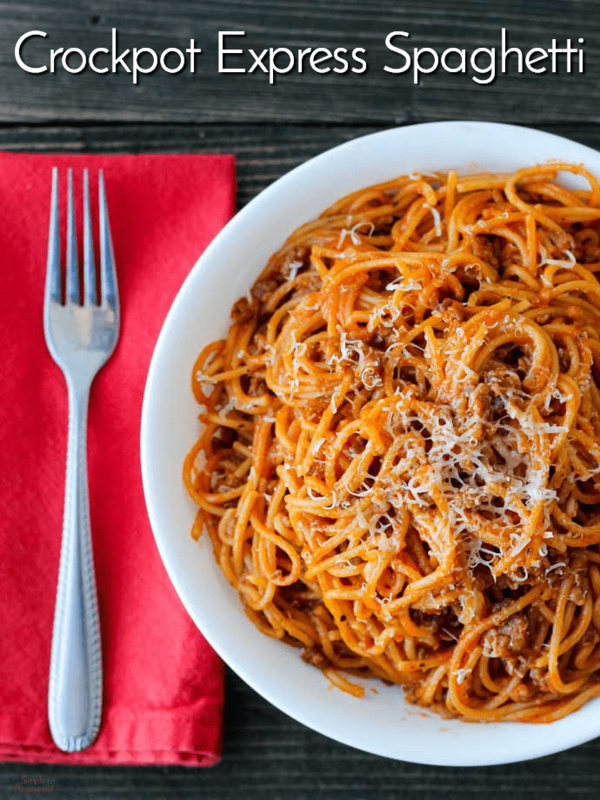 Crockpot Express Spaghetti makes a family favorite even easier to get on the table in record time. It’s perfect for busy weeknights and makes for great leftovers, too! One of the reasons I was excited about getting my Crockpot Express was that I knew it would simplify my life at dinner time. There are plenty of fantastic one pot recipes out there, but sometimes you just want to make old family favorites. Little by little, I’ve been converting my standby recipes into pressure cooker recipes. I was skeptical about pasta dishes in general, and it’s true-the overall cook time isn’t much different. However, Crockpot Express Spaghetti literally takes only 5 minutes to prep and then I can walk away and forget about it until it’s time to eat! 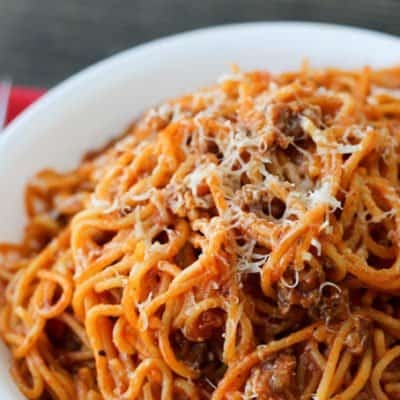 You can make Crockpot Express Spaghetti with either ground beef, ground turkey or ground Italian sausage. I prefer sausage for this particular method because it’s not greasy, and it’s full of flavor. Pressure cooking can sometimes produce bland food, so the spices in Italian sausage really help. If you decide to use ground beef, be sure to drain the grease before adding the other ingredients, as well as adding extra seasoning of your own. 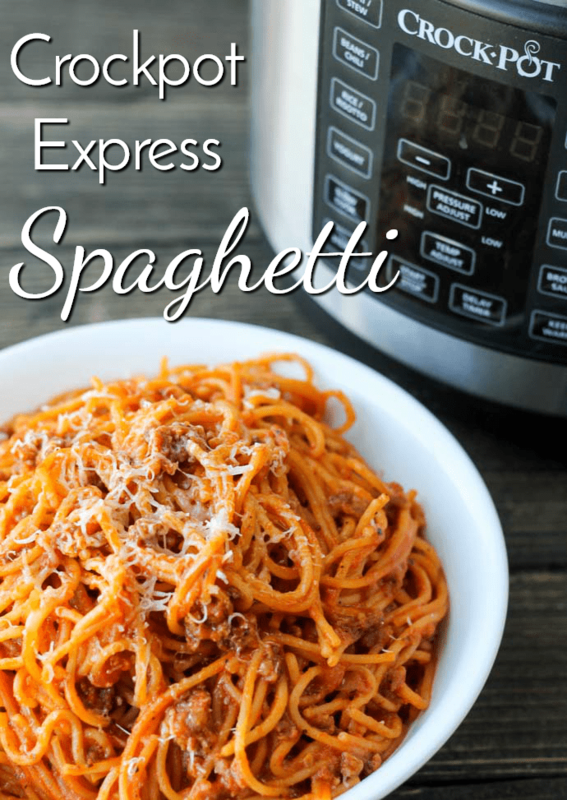 Crockpot Express Spaghetti makes a family favorite even easier to get on the table in record time. It's perfect for busy weeknights and makes for great leftovers, too! Press Brown/Saute and brown the sausage over high heat. (The HEAt display will stay on.) Press Start/Stop when the meat is browned and crumbled. Break noodles in half and place over the meat. Alternate the direction of the noodles back and forth in a # pattern. Pour sauce over the noodles, then fill the jar with water and pour that over the top. Be sure the noodles are completely covered. You may need to add a bit more sauce or water (or gently stir things around a bit) to get everything covered up. Press Steam and leave timer at 10 minutes, then press Start/Stop. When the cycle finishes and switches to Keep Warm, let it release pressure naturally for 5 minutes. After the clock reads "5" do a quick pressure release. Stir well with a wooden spoon to distribute the meat evenly throughout and break up any clumps of noodles. Sauce will thicken up a bit. Serve with garlic bread and salad for a quick meal! If you choose to use ground beef instead of ground pork or turkey, be sure to drain the excess fat before adding the rest of the ingredients! You may also want to add extra Italian seasoning. 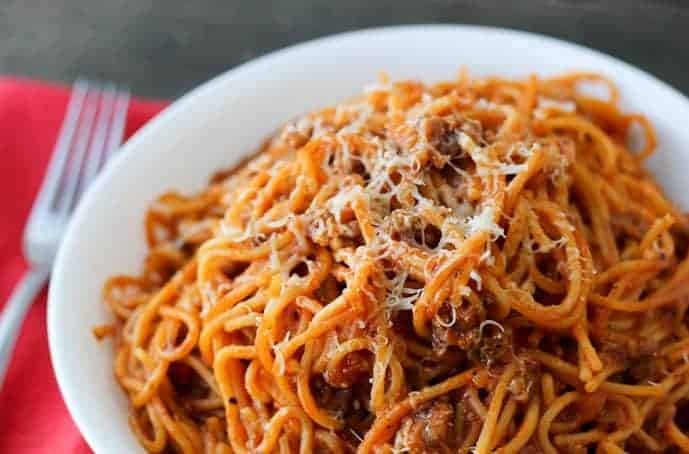 I may never make spaghetti the old way after seeing how easy it is to make Crockpot Express Spaghetti! My husband prefers to have the sauce mixed in with the pasta, rather than on top. Making it in the CPE really infuses all the flavor right into the noodles. Don’t forget to pin this for later! 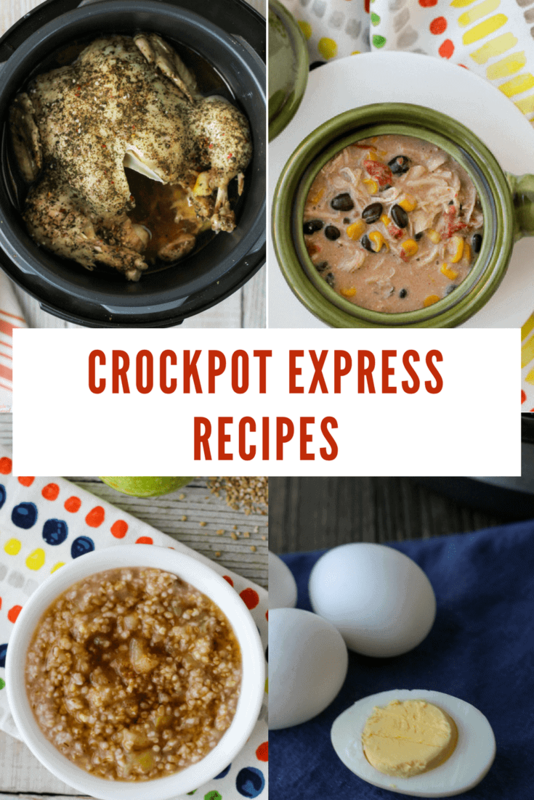 For other great (and easy) Crockpot Express Recipes, check out this page full of great tips and links to recipes! WOW!! That was so easy and delicious! Thank you so much for that recipe. We all loved it and one pot , what more can you ask for? Seriously!! I was trying to figure out what to cook when I didn’t really want to. Then I thought I have everything for Spaghetti and was like guess I can make that it doesn’t take too long. Then I saw my crockpot express and haven’t really used it a lot because the meals have come out bland every time. 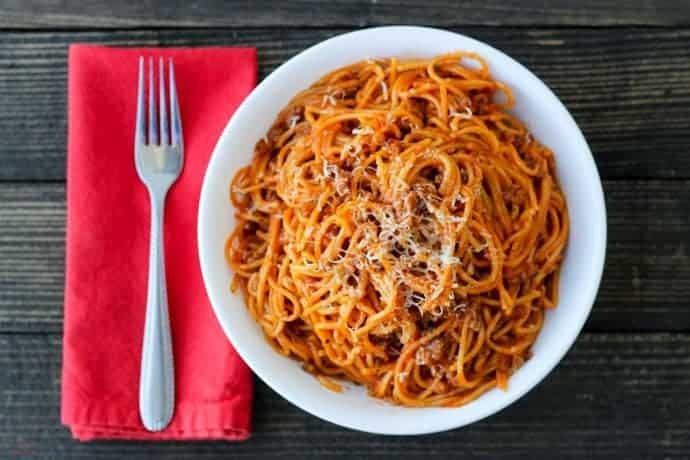 I google for crockpot express spaghetti find your page and do everything you say but since my jar of sauce is larger I added more of everything and because I said hmm… I don’t put water in my sauce why don’t I try Chicken Broth for more flavor. BEST IDEA EVER! Thank you for this! I will be making this recipe. Will be making this again. I’m glad you loved it! It’s much more flavorful than making it on the stove, I think! We love this for dinner. My four year old is hit and miss, lol, but that’s true for everything. Our 8 yr old loves it and even helps with cooking it. We use two pounds ground turkey to reduce the fat a bit & don’t even have to drain it. We prefer pasta noodles or spirals (not actual spaghetti) for our one year old twins. Pair it with a loaf of take and bake bread for an easy complete meal. Woah. I was so surprised on how well this turned out and how delicious it was. Some of my noodles did clump together but I think I will need to separate them more next time. Glad to hear that! I’ve found that certain brands do a better job of not clumping together. I used store brand spaghetti the last time and I had clumps all over the place, even with them being cut in half and criss-crossed. I stick with better brands for pressure cooking now! I’m amending my rating because now I am finding information that says you were not supposed to use the pressure cooking function for anything without liquid. Your first instruction does not mention using liquid with the brown saute function. I was trusting this recipe as only a second time user of my Crock-Pot Express and I cannot trust this recipe. You are misunderstanding how the Crockpot Express functions work. Brown/Saute is NOT a pressure cooking function. It’s just like sauteing on the stove top. You use it with the lid OPEN and with no water. Just like you would brown something on the stove. THEN, you switch to using the pressure cooker, which is where you add all the sauce, noodles, liquid, etc. Clearly, you can see this recipe works well as many other users have made it. We make it regularly. Before saying you can’t “trust this recipe” I suggest you read your manual thoroughly so you can get a better understanding of how your machine works. First step in the directions doesn’t make sense. If you’re cooking in a pressure cooker, how are you supposed to know when the meat is brown and crumbled? I responded to your last comment with more details, but short story: Brown/Saute is not a pressure cooking function. You keep the lid off while using it. 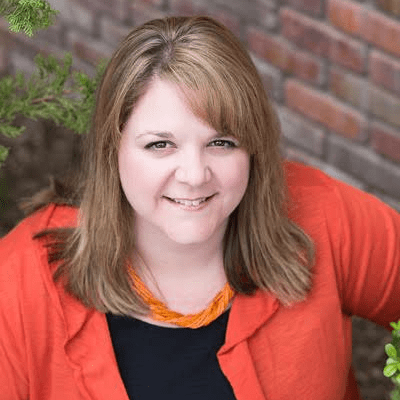 Dawn, this is like browning ina skillet. But it’s saving having to mess up more pots and skillets. I normally use two pots and 2 skillets. This way I’m only using 1. Less dishes and less mess! Tried this recipe. Noodles turned out well but the sauce is a bit too loose for my taste. Anyone used the frozen meatballs with this recipe? I have! 🙂 Just throw them on the bottom (no need to cook them first) and continue with the recipe as written. They are great! Making sure they are cut in half, spread out in a criss-cross pattern and covered completely with water will help with that. I followed this, but used Alfredo sauce, half a box of fettuccine, and followed your suggestions for a meatless option. It was my first try at the express cooker and it turned out perfectly! Thanks Nicole! I’m so glad to hear that it turned out well! Would you do anything different if no meat? Just wondering if pasta will cook the same or if it would stick if not meat on the bottom? For soups and other liquid meals you need to do a natural release, which could take at least 10 minutes or more. Quick release is any time you release the pressure before it’s released on its own. Honestly, I’ve started doing a quick release right after the 10 minutes are up because I like the noodles a little firmer. There’s no issue at all since the majority of the sauce has been soaked up already.